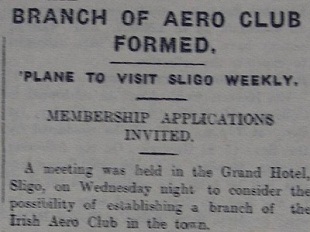 Aero Club was founded in Sligo – the first branch outside of Dublin. Sligo, like many Western seaboard counties, saw a considerable increase in aviation activity during the 2nd World War years. The adjacent “Donegal Corridor” – a route agreed by the Great Britain and Ireland governments – to facilitate US and UK aircraft routing to and from bases at Lough Erne, Co. Fermanagh. This route entered and exited the Irish Republic at Ballyshannon / Bundoran and consequently saw quite a few mishaps – mostly due to fuel shortages or poor weather. In 1949 local Sligo business man K.P. 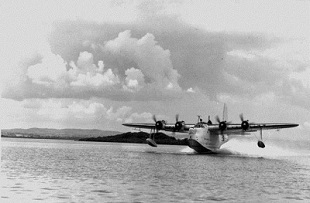 Murray commenced pilot training at Weston in a BA Swallow (EI-ADS) under the tutelage of Capt. P.W. Kennedy. He soloed in 5hrs:30mins. 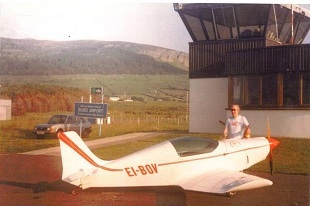 Mr.Murray subsequently purchased a BA Swallow (EI-AFF) which he operated from Rosses Point where he had a grass strip and hangar adjacent to the Co. Sligo Golf Club championship links course. 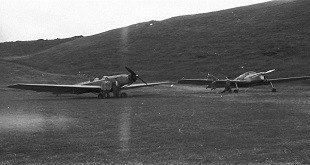 1950’s Pictured right at the Rosses Point airstrip are the Swallow (EI-AFF) aircraft and a 4 seater Miles Messenger (EI- AGB) which were owned by K.P.Murray during the early 1950’s. This was followed by another Messenger in 1953 (EI-AGE). Murray, who was a many times Irish Motoring Champion (Test Trials), based the aircraft at Rosses Point where he had a grass strip and hangar adjacent to the Co. Sligo Golf Club championship links course. He was well known for his aerial photography – mostly using a camera mounted underneath the aircraft and operated from the cockpit – and he has left a unique pictorial record of many buildings, infrastructural projects and general views in the North West region. Murray was involved in the rescue of three men from the Blackrock Lighthouse in Sligo Bay in October 1956. An unexpected change in weather had left the men stranded and without food. Murray, accompanied by fellow Sligo man Comt. 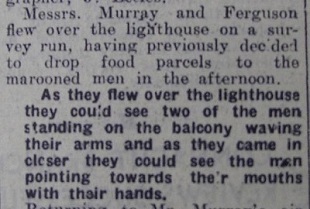 P. Ferguson (ex Irish Air Corps), flew over the lighthouse and observed the men who were signalling that they required food. Before any food could be dropped an RAF helicopter ( a Westland Dragonfly) arrived from Derry and lifted the men to safety. (EI-ATK) - was purchased for training pilots. 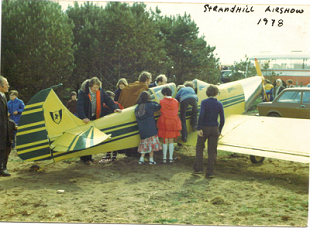 Many of the early Sligo pilots trained at Castlebar and subsequently formed Sligo Aero Club in 1975. One of these pilots local man, Gerry O’Hara, who from an early age had been constructing hand launched model aircraft began building a full size aircraft in 1966. This, low wing monoplane, although never engined, was shown as a static display at an airshow at Sligo Airport in 1978. O’Hara also constructed a gyrocopter which he first flew in 1971. 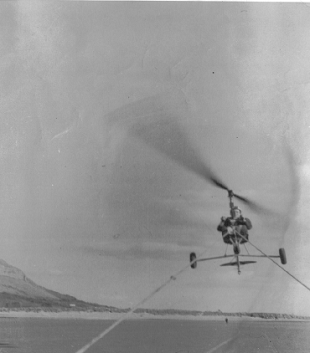 He built the entire airframe and rotor blade himself and carried out extensive “tethered” testing before being towed in to the air at Culleenamore Beach in Strandhill, Sligo in 1971. Gerry is pictured on the right during the first flight. Sligo Aero Club was formed in 1975 and operated from a grass strip at Coolaney, Co. Sligo. It started operations using a Rallye MS880B. It moved to the present Sligo Airport location in 1978 and quickly the number of private aircraft based at Sligo grew to 11 within a year or so- with an interesting mix of Rallyes, Cessna, Piper and various tail-wheel aircraft. In 1984 psychologist Dr Brendan McGann – a former Aer Lingus B707 Navigator – started a youth training program at Sligo airport in conjunction with the Youth Employment Agency. This group (known as Air Alpha) built a number of all metal Zenith kits fitted with Lycoming engines - the first of which flew in 1985 (EI-BKM). Others built under this scheme included EI-BKP and EI-BYL - a CH-250 . In the meantime Gerry O’Hara was busy building a Rand KR2. This wood and fibreglass aircraft, fitted with a Volkswagen engine was completed in 1986 and made its first flight on February 19th of that year. It was featured in the renowned American magazine “Sport Aviation” as well as being the subject of an RTE documentary in 1989. Surrounded by a now fully developed commercial airport , which had Iona, Avair, Aer Lingus and Ryanair as operators, the aircraft building skills of the Sligo Aero Club members and other young persons were put to use once again – this time building a series of Vans RV aircraft. These were all constructed under the watchful eye of the UK PFA and resulted in a considerable number of local young people gaining experience in aircraft construction techniques. This experience was authenticated by the UK City & Guilds and most of the persons involved went on to secure employment with large aircraft maintenance organisations. 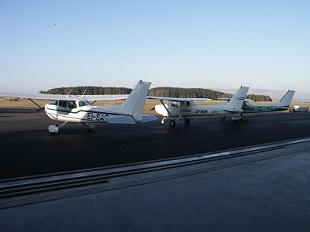 Sligo Aero Club continued to thrive now having moved to Cessna aircraft as the preferred trainers and having a membership of almost 100 at its peak in 2005. Copyright © 2019 Sligo Airport Ltd. All rights reserved.